The Good: Kam Chancelor, Darren Evans, Brandon Dillard, Macho Harris, Jason Worilds, Sean Glennon, and Greg Boone. Why? Kam Chance has made the move from rover to free safety and is absolutely dominating. VT safeties typically have a lot of tackles because they are always involved in the run, not to mention the guy can defend the pass and flat out hit. Good move there. Darren Evans has taken full advantage of Ore’s departure, and the injuries to KLew and Cheese – this guy may be our starting back this fall: he has size, speed, and can really hit the hole. Brandon Dillard is stepping up as the go to guy in our unfamiliar receiving core – in case you didn’t notice, he made people miss all over the place in the spring game – a lot to like there! Not much needs to be said for Harris, as he is going to be all over the field this year – offense, defense, and special teams – it should be a great year for him. Worilds is absolutely punishing our offensive line, which is good…he will help our line get better and will be in the opposing team’s backfield a lot. Sean Glennon, why do you torture us? All spring he has been hitting receivers in stride and making smart decisions – let’s hope he does the same this fall. Lastly, Greg Boone may end up being the offensive MVP this year – he has shown terrific hands and great blocking, not to mention he has been running a little bit, too. Imagine him in the backfield for a few series…scary! The bad: Offensive line, our place kickers, and anyone not named Macho/Kam in the secondary. The ugly: Tyrod Taylor, The Cheeeeeeese, our linebackers, and the depth on our DLine. Why? The next great thing from Hampton Roads has had an ugly spring. No offense to him, but he still has some work to do before he leads us to glory. This is no knock on him at all, but he only makes one read and starts running, but hey, at least he can run. Glennon will take one look and then get pasted by a lineman or linebacker because well, he just can’t run. Tyrod will be a phenom when he leaves VT, but still has a lot to learn. The reason we put Cheese on here is not because of how he played (he was actually quite awesome), but more because the man can not catch a break. Fumbles and lack of blocking were holding him back before, but now he has a broken fibula and is out for six weeks – talk about tough luck. The linebackers are doing OK, but they have to go here because they are not Vince Hall or Xavier Adibi. Purnell Sturdivant and Brett Warren are trying their best to fill in admirably, but it won’t be the same. 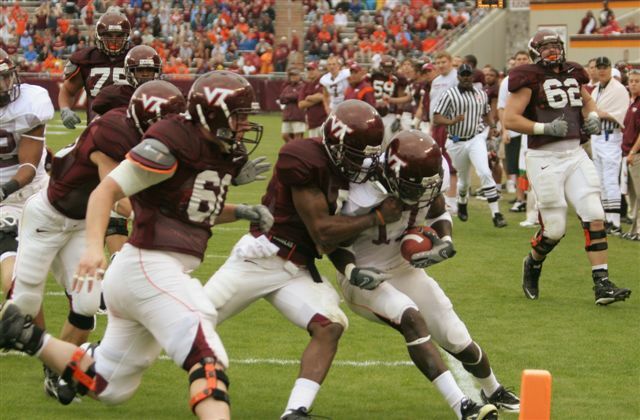 Again, no knock on them, but we will miss the best two linebackers to ever attend VT. Lastly, while we have some serious players on the defensive line in Worilds and John Graves, we just lack some serious depth. An injury or two could really cause some trouble for us. So that’s it for the spring, folks, as the players now have a break until they resume practice in August. What can we expect? At this point, don’t be shocked if we lose to BC and FSU on the road. For now, I think we finish 10-2 and play and win the ACC title game. Until seen otherwise, the Hokies have the ACC to lose. You are currently browsing the archives for the Macho Macho man category.